Now before you go getting all indignant, three things... that's our last name up there (sort of), we did fight, and that's actually the logo of the Univ. of Northern Colorado. Go buy a shirt to make them happy and to keep me from getting in hot water for using their logo! My parents taught me a lot of things that I am grateful for. They provided a good environment for me to grow up free of a lot of the shackles that binds people's minds down. They raised me to be independent minded and to strive to use good judgment. They taught me that I had to earn my way in life and never expect things to be given to me. Then, in the midst of all this sanity and reason, they tossed in the hot rods. Oh yes, those thundering beasts. Thank you Mom and Dad for giving me the urge to never be satisfied with any car until I've made my mark on it, even if a lot of those marks are accidental. Legend has it, my mom was at Amarillo Dragway perched atop my dad's hot rod of the time watching the top fuelers run when she went into labor. That sure as hell explains a lot. Thanks Mom and Dad. As if my chances at sanity were slim enough growing up in that nuthouse full of pranks, gags, pitfalls and intake manifolds, you had to go and expose me to the addicting feel of raw pull-your-hair-out-by-the-roots horsepower. 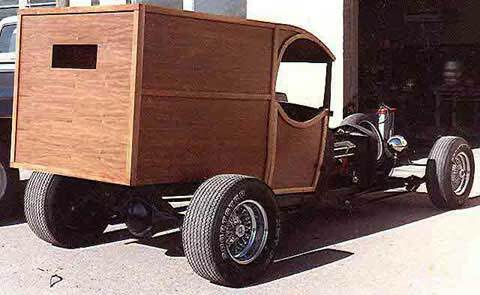 Well, pilgrims, this here is what ya might call one hell of a Woody. "huh huh uhhh huh huh... he said 'woody'"
My dad and I did this one. Dad was the force behind the chassis and the body cage. For some reason he was more than happy to let me do all woodworking and the thread running for the hundred or so brass screws holding that cherry trim and walnut paneling down. 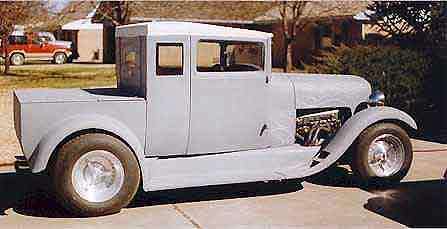 Shown here sporting a 327 with dual quads, an early Olds 3.57 rear end and an MAS dropped front axle, it also at one time had a 455 Buick in it. Dad still has most of this big boy in his garage and back yard and if I finish my wagon in the next year or so and he doesn't get to it before I do, I may just go reclaim it <grin> If I did, I think I would want to radius the body and cut the axle to put even bigger rear tires on it, then find some way to add a back hatch with a bigger rear window... maybe a hatch. 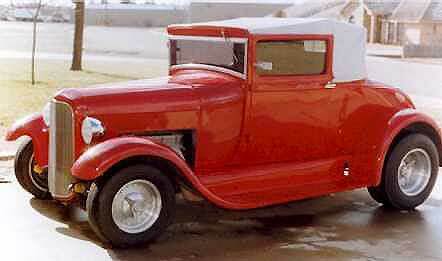 Now this radical little ride is my Dad's 28 Ford Sport Coupe. When I was a kid, this car was basically spare parts plucked from a farmer's trash pile. I may be wrong, but as I recall, Dad went looking for parts to help out on the '29 Ford truck he acquired from my grandfather and found a whole car's worth of parts. Hell, he even left some behind out of feeling guilty for taking too much! Over the years, this car just sort of emerged from the ashes like the great Phoenix and right now it sports a big block Chevy engine with a Turbo 400, Mustang II rack and pinion steering, and a 9" Ford rear end. Now Dad has kind of gone sacrilegious and put 2.70 gears in that rear end, but hell, he actually drives it everywhere. And I shouldn't have to point out that he doesn't farm out any work on his cars, either. Ah, my old high school ride. Hell yes, I still have it! Twice resurrected from the weeds, this is a '55 model 150 2door wagon. Back then, it ran a 360cid with massaged heads and homemade headers (notice I am NOT showing those). Transmission was and still is an aluminum T-10 and the rear end is 9" Ford with 4.56 gears. Yes, the engine could handle them <sly grin>. This poor car became a victim of sitting too long, so I'm going through it all over again. Check the journals if you want to see more. And the red one to the right? Probably one of the bigger surprises in my lifetime! My mom's brother decided after going to street rods shows year after year that he wanted one and the bug bit him. Last I heard, even when he thought he might sell it, he couldn't go through with it. Welcome to the club, Uncle Glen. How's this for a fun little ride? 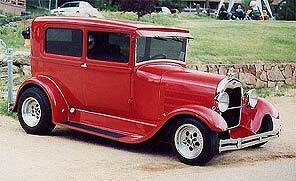 Now powered by a small block Chevy (pictured with a big block), this '29 Ford used to be my grandfather's. I can guarantee you it didn't look like this to begin with. It may still be primered, but it's already street legal and..... this one is my mom's ride, so all you jackasses that said something about driving a momma's car, do you really want to go there? This wide ol' boat is a 1969 Plymouth GTX. 440 engine and a handful all of its own. I bought it to cruise in right away. Little did I know what evils lurked behind every panel, but by God, it cruises now! Here's my latest project... this one is what's left of a '48 Austin A-40 Dorset. Poor thing is half rotten with rust underneath, but in retrospect, it's far better initial condition than dad's Model A started out! And again.... I have started a journal for this one, too. But... don't expect much. I haven't touched it since I got it. Too many irons in the fire, and if I have my way, I'll have even more irons later!